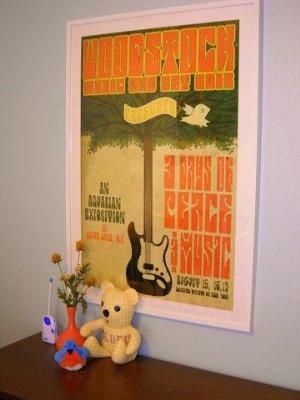 The decision to decorate my son, Holden's, Woodstock nursery theme in a vintage style was made when my daughter and son-in-law found a vintage Woodstock poster they loved. That year was the famous musical event's anniversary and between that and the poster, they were inspired to create a musical baby nursery theme. Since their home is mid-century modern and decorated in shades of green, yellow and orange, the poster was a perfect fit. My daughter chose cream colored bedding in an embossed circle pattern and a very simple dark wood crib. I painted a huge tree on the mint green walls and put orange cut-out leaves from JoAnn's Fabric in the tree, along with a stuffed bird put out for the Audubon Society that makes the actual call of the bird. I made curtains out of a broadcloth print of tiny green, orange, brown and gold circles on a cream background and finished it with a wide band of orange and cream polkadot fabric. I made a coordinating quilt with the tiny dots on one side and a brown geometric print on the reverse side. 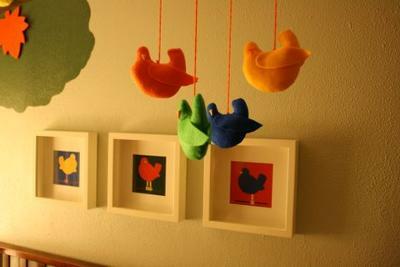 I painted three pictures of the "Woodstock bird" in blue, green, orange and yellow and gave the same birds texture and dimension in a felt and yarn mobile suspended from an embroidery hoop that I stained to match the crib in Holden's Woodstock nursery. My daughter bought an orange rug from Crate and Barrel to put on the dark hardwood floor and a tall, rectangular floor lamp from Ikea. In the opposite corner, we put a green leather rocker, above which we hung a picture my daughter received as a shower gift that has Holden's name on it. Above the long dresser (which also serves as a changing area), I hung the Woodstock poster. Beneath it I put a small orange Crate and Barrel vase holding yellow dried botanicals, another Audubon bird, and my daughter's yellow gingham "Boogie Bear." I cross-stitched Holden's name on the tummy where a red felt heart had once had his mother's name embroidered. Dana, thanks so much for sharing not only your pictures of Holden's Woodstock nursery but for telling Unique Baby Gear Ideas's visitors how it came about including step by step instructions! This helpful guide will inspire other moms to think outside the box when brainstorming designs for their baby's room. What an amazing, unique nursery theme! Woodstock fans and all music lovers will appreciate this design! I love the colors that you used. They make the room very warm and inviting. The room seems decorated but welcoming. 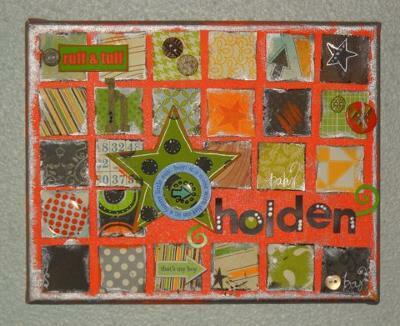 Thanks for your nice comment about Holden's Woodstock room. I know you were kidding about my designing you a Snoopy room, but I LOVE to decorate, so I just had to take a look at what's available. I found lots of Snoopy stickers on amazon.com that could be used as a pattern for a mural if you have access to an overhead projector for enlarging. Target has lots of cute Snoopy things too. I can't wait to see what you come up with! I found your cute nursery looking for Snoopy's Woodstock, not the music festival. But I couldn't leave without casting a vote and telling you how I admired your work. 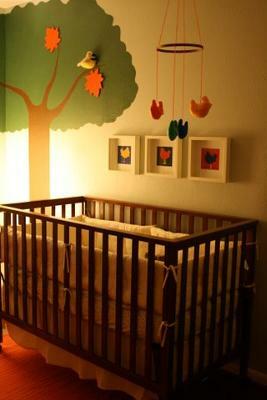 Could I possibly talk you into designing a Snoopy nursery that I could copy to make my job easier?